This property is a well maintained and well loved home which backs on the reserve and is perfect for families. Located in a quiet street, it is a great place for families to stay and enjoy Dinner Plain. This cosy chalet features 2 bedrooms, 2 loft style bedrooms, and 1 bathroom. 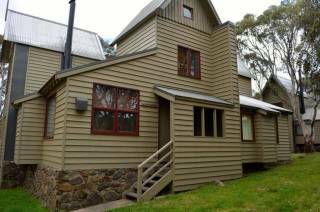 Situated a short walk away from Dinner Plain's eateries and the local ski run. This gorgeous chalet is located on the footstep of the commercial district of Dinner Plain. With 3 spacious bedrooms and 2 bathrooms, this property is sure to impress its guests! Deep Powder a refurbished, fantastic chalet. It is a very cosy house with lovely views from the back deck of the treed reserve. It is a great family house with a unique floorplan which allow a parents' retreat separate from what is perfect for a childrens' sleeping quarters. Traditional older style Dinner Plain chalet with a beautiful feature stone wall fire place, spacious kitchen and large balcony with BBQ. Great location, close to all facilities and just near the Dinner Plain ski lift. Ideal for families or groups any time of the year. Double Bridges is a self catering chalet and is not serviced during your stay. Bunny Box is a comfy and cosy 3 bedroom, 2 bathroom chalet over 3 levels. Good size bedrooms and bathrooms. It has just about everything you need for a great holiday winter or summer. Small out door hot tub on the balcony overlooking the reserve, great way to unwind after a day on the slopes or in summer after bush walking, riding or just relaxing. Bunny Box is a self catering chalet and is not serviced during your stay. This luxurious 3 bedroom chalet features state-of-the-art furnishings and appliances with sensational views of the nearby Alpine National Park from the lounge on the first floor. A centrally located gourmet kitchen, large open living and dining areas with plenty of room for the family to rest and play makes this a very special holiday property! This modern property will boast 3 bedrooms, a centrally located kitchen with state of the art appliances, large open living and dining areas with plenty of room for the family to rest and play making it ideal for your holiday! This brand new, fully furnished three bedroom (plus bunk room) chalet is set amongst the trees in beautiful Dinner Plain. The luxury chalet will ensure you enjoy the ski season or the country side in superior comfort. Sleeping for 10 people, there is also a queen sofa bed that can sleep an additional 2 persons. 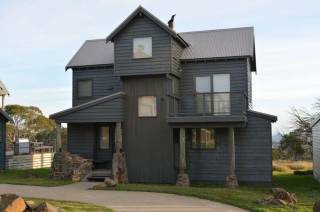 Snowgoose is a comfortable and spacious updated traditional Dinner Plain alpine chalet with 3 bedrooms, 3 bathrooms plus a loft. Large living area and open fire is complimented by views onto the reserve. The decking has BBQ undercover and is suitable for all year round relaxing. Snowgoose is a self catering chalet and is not serviced during your stay. This well-appointed chalet offers state-of-the-art appliances, with an open fireplace and an indoor spa pool. Housing 4 bedrooms and 2 bathrooms this property sets the perfect scene for a family get-together or a gathering of friends alike! Elegant Dinner Plain Chalet that is beautifully appointed throughout. Plasma TV, IPod docking station, quality kitchen, heated bathroom floors, balcony with views over the reserve, ideal for families, couples or anyone looking for something special for their holiday. Alpenglow is a self catering chalet and is not serviced during your stay. Sorry this property is NOT pet friendly. 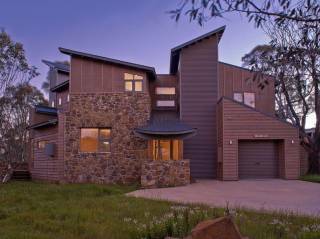 Builder is a winner of 2008 HIA Vic Housing Award at Dinner Plain. 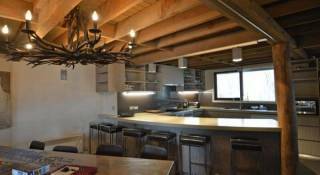 This luxury chalet is centrally located behind the Onsen/Day Spa. Beautifully appointed with 3 bedrooms, 2 bathrooms, balcony, BBQ, Ideal for your winter or summer holiday. Bunk room offers 2 extra trundle single beds for families. Heavenly is a self catering chalet and is not serviced during your stay. Sorry, this property is NOT pet friendly. This beautiful and sophisticated chalet is located near the Dinner Plain track with lovely balcony views over the reserve. My 3 Boys offers you a large open plan kitchen, dining area with a cosy fire place in the lounge, built-in day bed to take in the sun and views of the area. With 3 large bedrooms, 2 bathrooms one with spa bath and a good size drying/ski room to suit everyone. Spacious for 2 families, plenty of room for the kids to play, BBQ to enjoy on the balcony and only a few minutes’ walk to the Village – what more could you want! You will feel right at home in My 3 Boys any time of the year. My 3 Boys is a self catering chalet and is not serviced during your stay. Pet friendly on application only. This luxury chalet is sure to impress, 3 bedrooms 2 bathrooms, spa bath, Plasma TV's, extra TV room or the kids! Quality fixtures and fittings throughout. Great location, close to the bus stop to Hotham, enjoy the sunny balcony which offers relaxing views over the reserve. Ski Break is a self catering chalet and is not serviced during your stay. Sorry this property is NOT pet friendly. This stylish property is perfect for summer rentals, offering 3 bedrooms, 2 bathrooms, and large spa pool. Quality fixtures and furnishings and close to all facilites. Blue Ice is not pet friendly. You won't be suffering from hallucinations when you step inside "Absinthe"! Upstairs offers a large inviting open plan kitchen, living, lounge area, with windows that soak up the sun and give you views over the reserve and the snowgums. "Absinthe" also has 3 spacious queen size bedrooms all with LCD TVs , 3 bathrooms (2 ensuites), bunk room of 4 for the kids and a very generous drying/ski room. 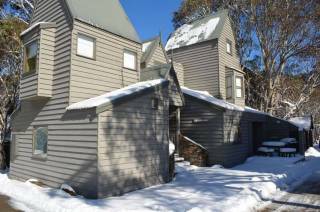 This chalet is in an ideal location,stroll to restaurants, all facilities and the bus stop to Hotham. Perfect for families and groups - Cheers! Absinthe is a self catering chalet and is not serviced during your stay. This stunning property with uninterrupted views overlooking the reserve is sure to please. Offering 5 bedrooms, 2 large bathrooms, great balcony with BBQ, garage. Tastefully furnished throughout. Ideal for winter or summer. Alyeska is a self catering chalet and is not serviced during your stay. Sorry this property is NOT pet friendly. This delightful chalet can accommodate 10 guests in comfort. Sporting 4 bedrooms and 2 bathrooms, a large living/dining area and spectacular views of the surrounding Alpine National Park. This property is the ultimate spot for the family to rest and play. We are really happy to recommend this property for families and groups alike. A very well equipped kitchen overlooks the open plan living and dining room areas which will make entertaining, wining and dining so easy. You'll be so much at home here you won't want to leave! Great location, great views over the reserve "Perfect" High Plains Drifter is self contained, is not serviced during your stay. Sorry this property is not pet friendly. Arapaho is a warm, inviting and spacious 4 bedroom chalet that will suit couples and families alike. Sit back in the comfy leather lounge in front of a beautiful open fire and enjoy the serenity! Very well maintained by its loving owners, Arapaho is in an ideal location, close to the DP bus and all facilities. The BBQ is a kettle/heat bead type, please note heat beads are not supplied. This freshly renovated chalet features 3 generously sized bedrooms and 2 bathrooms. The loft has six single beds and a cosy TV/Video/Games nook, perfect for children and adults alike. With a sunny deck and BBQ at rear, this property makes for a perfect family/group holiday! It is a pleasure to list this property for rental! 4 spacious bedrooms, 2 bathrooms, spa, quality fixtures and fittings, great open plan kitchen, living, lounge area and ideal location in Halter Lane. Kimberly One is a self catering chalet and is not serviced during your stay. Sorry this property is NOT pet friendly. This property is an entertainer's delight with 4 bedrooms, 3 bathrooms and a spa pool. Featuring two balconies, one of which has a BBQ & outdoor seating, this property affords lovely views of Dinner Plain Village and the adjacent National Park. Set on the village fringe, all eateries and facilities are merely a short stroll away. This gorgeous property has recently been extended, featuring 4 bedrooms, a kids retreat in the bunk room, a cosy TV corner on the first floor and 3 bathrooms, one of which includes a corner spa bath. Great central location in the heart of Dinner Plain, 3 bedrooms 2 bathrooms, large open plan kitchen living lounge area with a big open fire, an original Dinner Plain chalet with lots of room for everyone. High Knob is a self catering chalet and is not serviced during your stay. This delightful chalet is popular with the families as it houses 5 bedrooms and a well equipped kids' retreat. Centrally located in the village with a lovely outlook on the surrounding Alpine National Park this property is the perfect holiday destination! This gorgeous chalet has just recently had a makeover, featuring 4 bedrooms, 2 bathrooms, a games room with a pool table and a spa pool. The spacious bedrooms, storage areas and lounge are just a few examples of the many features of this delightful property. Perfect for large gatherings of families and friends. This stunning property has been completely refurbished. It has 6 bedrooms, 5 with ensuite bathrooms, a lovely fireplace and backs onto a picturesque reserve. 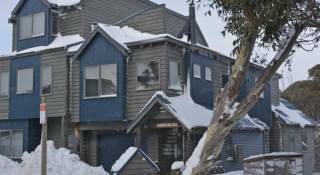 Situated close to the Dinner Plain Ski run and the shuttle bus stop. One of Dinner Plain's finest properties, overlooking the reserve this fabulous chalet has 6 bedrooms, 6 bathrooms, 5 spa baths, large kitchen and big balcony with views that go for ever. You will want to come back and stay at Camelot any time of the year. All you have to do is arrive and unpack your bags. Camelot is a self catering chalet and is not serviced during your stay. Sorry this property is NOT pet friendly. Banjos is large lodge-style property with 5 bedrooms, 2 loft style bedrooms, 3 bathrooms and a spa pool. The living area has a sunken lounge with a woodheater and a separate sofa area incorporating a window seat, perfect for sunny winter days. The deck outside hosts an undercover BBQ area with a northerly aspect. Dinner Plain Accommodation, with an extensive portfolio of self contained chalets, cabins and fully self-contained apartments in the alpine village of Dinner Plain, finding the right accommodation has never been easier. Linen and towels are provided in all accommodation. Designed to compliment the beautiful snowgums and history of the area, Dinner Plain is open all year round and offers a choice of accommodation the mountain cattlemen could only have dreamed of. Located high in the mountains in the heart of the Great Alpine Road halfway between the Great Alpine Valleys and the Gippsland Lakes, Victoria. There’s bars, cafés and restaurants open throughout the year. Relaxing by the fireside, exploring the bush tracks and trails, mountain biking or skiing and kids playing in the snow during the winter months and located just 10 km from Mt Hotham Alpine Resort.- there’s something for everyone at Dinner Plain Indulge in the unique experience that is Dinner Plain. Walk it, ride it, bike it, ski it, Dinner Plain....Enjoy it!! A $50 deposit is required at the time of making your reservation to confirm your reservation. Balance of payment is required 60 days prior to arrival. If the booking is made within 60 days of arrival full payment is required to be made at time of booking. Where the deposit is unpaid within 60 days prior to arrival Dinner Plain Accommodation reserves the right to cancel your booking without further notice to you. Dinner Plain Accommodation accepts the following credit cards - Mastercard, Visa and AMEX (a 1.5% surcharge to applies to Visa and Mastercard and 3.3% surcharge applies to AMEX). For all properties a security deposit of $500.00 is required on or prior to your arrival at Dinner Plain. It may be paid by credit card or cash only. The security deposit will be held in trust and refunded in full, within 7 days of your departure date, provided that the property was left in a clean and tidy condition with no undue damage caused or excessive cleaning required. When planning your stay, please be aware that check in is available from 4:00pm in WINTER and 2:00pm in SUMMER and the check out time on your day of departure is 10:00 am. If you think that you will not arrive before 5pm on your day of arrival, please call our office to arrange the collection of keys after hours. Should you require times earlier or later, they are strictly subject to availability and may incur an additional day use charge. Dinner Plain Accommodation recommends guests purchase Travel Insurance, which is generally inexpensive, but can really save a lot of emotional distress if an unforeseen event occurs. We recommend your travel insurance will cover you for airline flight and accommodation cancellation. We also recommend you are covered for accident, illness, medical evacuation and theft. The property that you have reserved may become unavailable due to circumstances beyond the control of Dinner Plain Accommodation. In such instances, Dinner Plain Accommodation will endeavour to place you in alternative accommodation, however, is unable to provide any guarantees in terms of the availability and facilities of the substitute accommodation. If equipment and or facilities fail, Dinner Plain Accommodation will endeavour to get it back in working order as soon as possible/practical; no refunds or compensation will be paid for any such breakdowns. As certain utensils and appliances are not standard across all of our properties, should you require specific items such as a coffee plunger, baking tray, egg rings/cups, hairdryer, etc. we strongly recommend that you bring your own to avoid disappointment. Fire Lighters are also a great idea, to help you quickly start a wood fire. Cancellations made more than 40 days prior to the arrival date incur a penalty of a $100 service charge. We strongly recommend guests take out Travel Insurance to cover against cancellation penalties. When a change request is received within 40 days of the arrival date, this will be treated as a cancellation and will be subject to the cancellation policy above. If there is a change in dates which shortens the original booking, the original booking cost will still apply. Any changes to extend the booking, utilising the original dates booked, will not be penalised. Changes in dates, which do not utilise the original dates booked, will be treated as a cancellation and will be subject to the cancellation policy above.